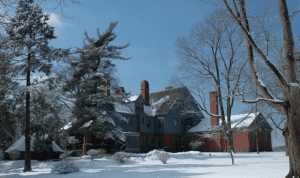 The Sagamore Hill National Historic Site has announced their scheduled winter events. Sagamore Hill, home of Theodore Roosevelt is open Wednesday-Sunday. Operating hours for the Visitor Center & Bookstore, Old Orchard Museum, and the Roosevelt Home are 9AM-5PM. The grounds and nature trail at Sagamore Hill are open 7 days a week year round from sunrise to sunset. To coincide with the “Conservation from Here” Roosevelt Elk installation, a naturalist will set up a table with elk pelts, antlers, informational posters and be on hand to answer questions on the natural history of elk as well as Theodore Roosevelt’s involvement in their conservation. Meet at the Old Orchard Museum at 1 pm. On September 6, 1901, the 25th President of the United States was shot on the grounds of the Pan-American Exposition in Buffalo. A park ranger will give an overview of the events leading up to September 6th and the immediate aftermath, focusing on President McKinley and his successor, Theodore Roosevelt. Meet at the media room at Old Orchard Museum at 2 pm. The Great Backyard Bird Count is an annual citizen science event coordinated by the National Audubon Society. There will be a short introductory program at Old Orchard Museum at 10 am, followed by a bird identification walk on the grounds of Sagamore Hill. Data collected on the walk will be submitted as part of the national bird count. Participants should dress appropriately for the weather and bring binoculars, cameras, and birding guides. Following Theodore Roosevelt’s death in 1919, former First Lady Edith Kermit Roosevelt would remain at her Sagamore Hill home for another 29 years. Join a park ranger for a talk on Mrs. Roosevelt during this often overlooked period of her life. Meet at the media room at Old Orchard Museum at 2 pm. Sagamore Hill will be open for regular operations on Monday, February 19 in observance of President’s Day. Tickets can sell out on holiday weekends, so be sure to arrive early or make reservations online to ensure a tour of the Roosevelt home. A volunteer naturalist will lead a nature walk to Eel Creek to observe winter birds. Dress appropriately for the weather and bring binoculars, cameras, and birding guides. Meet at the Visitor Center at 10 am. For more information about Sagamore Hill National Historic Site, visit their website or call 1-877-444-6777. Photo of Sagamore Hill National Historic Site, provided. MY friend who lives on Long Island took me there last summer and I so enjoyed it. Will the house be open in February if the government is still shut down?